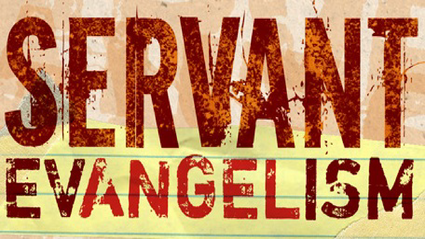 Servant Evangelism: Fresh Fruit Give-A-Way Sat, April 13, 10 a.m.
Would you like to share God’s love with others? South Bay Bible Church shows our community the love of Jesus in very practical ways through Servant Evangelism opportunities. Our next project is a Fresh Fruit Give-A-Way. The SE team will meet at the church, 578 Montauk Highway, East Moriches, on Saturday, April 13, 2019, at 9:50 a.m. and work from 10:00 a.m. to 12:00 noon. But … this is no ordinary Fresh Fruit Give-A-Way because this is a South Bay Church Servant Evangelism Project. We will be giving away a package that includes an orange, apple, and banana along with an invite to our Easter services. Servant Evangelism projects are simple, straightforward ways to share God’s love in an easy, practical way that anyone can do with no strings attached. SE often reveals open doors to share more about Jesus and even allows shy people to launch into effective evangelism in a non-threatening way. SE is low-risk, high-grace opportunities to bless deserving and undeserving people – just like God blesses us. This giving-centered approach is easily picked up by new Christians, appeals to every segment of our community, is emotionally safe, and provides an open door for the miraculous – when God so moves. And – it’s also big fun! Another great benefit of Servant Evangelism is Christians will be built up in their courage to share their faith with unbelievers. As fearful Christians meet unbelievers in safe, non-confrontational settings where they experience success, they gradually grow in their ability to tell others what Jesus has done for them. SE is a baby step in faith-building exercises. Why does the church exist? South Bay Bible Church is all about leading people into a growing relationship with Jesus Christ. For many people, the very first introduction to God's amazing love is often your step of faith in a SE project. God’s love will flow through you. Freely you have received; freely give (Matthew 10:8) – no strings attached! Let’s saturate our community with the presence of God through deeds of kindness.